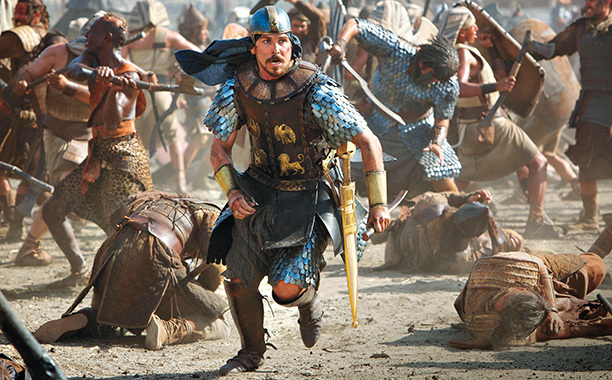 EXODUS: GODS AND KINGS —-Epic maestro Ridley Scott’s mammoth 2014 non-ideological incursion onto the baked plains of Bible literalism and its standard cinematic box canyon of corn-ripened DeMille shrillness showed up at Christmas: in its $140,000,000 CGI wake it left controversy (“how could he? how dare he?”), puzzlement (“what was he saying?”) and shrugs (“cool to look at, immediately forgettable”) washed up like so much debris from the smite-this, Grampa of awe-droppers—the parting of that good old Red Sea. In Scott’s 150-minute take (a catnap compared to the Van Winkle rip of The Ten Commandments eonic 231) the climactic wash & rinse, despite advanced technique, isn’t as smashing as the 1956 placeholder, and before it drowns all those chariots enough wildly imagined effects have already been displayed to sate spectacle fanciers. The plagues—frogs, flies, boils (yeeuck), hailstones and a bloody Nile with ravenous crocs (it’s a crock?) 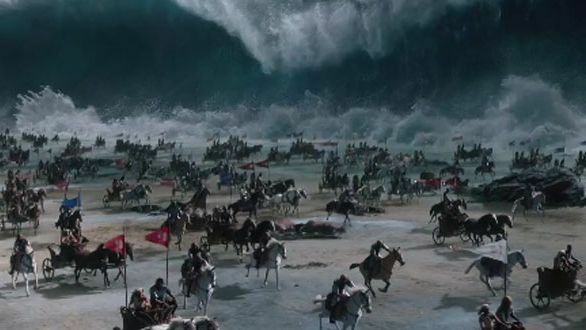 are suitably Big Movie cool, along with a king-sized (Scott-sized) opening battle scene. That battle, and other action set-pieces (Ridley does flaming-object-projectile-hurling as good as anyone since Stalin took Berlin) effectively make this Moses-Pharoah contest into an action pact, rather than a faith finding mission. 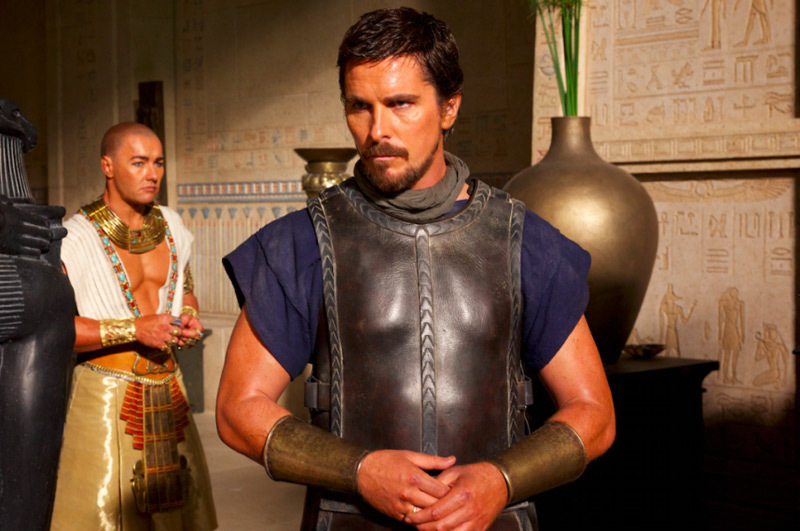 Moses (brooding Christian Bale) becomes warrior more than messiah, and Pharoah (sulking Joel Edgerton) less of monarch than jerkweed. Other characters are given little dimension or even screen time—Joshua (Aaron Paul) might as well be just plain Josh, for all his input; other personages and performers fare likewise. 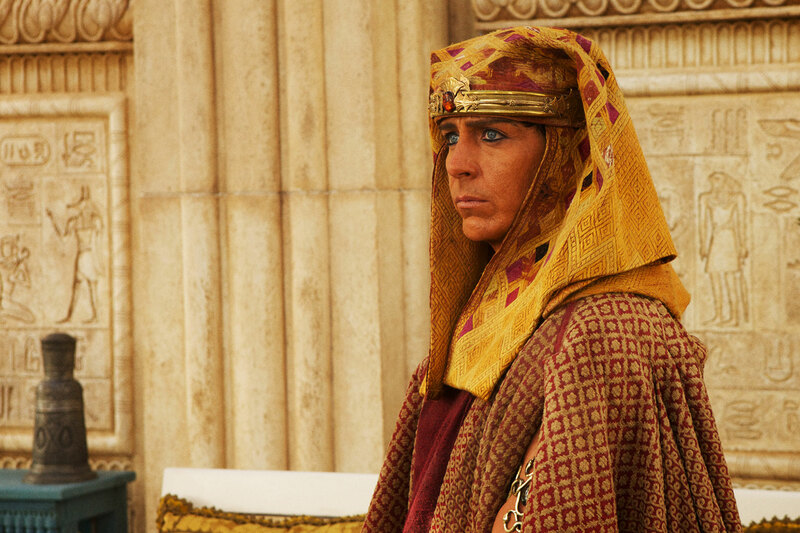 Ben Kingsley shows up briefly (Ian McKellen or Anthony Hopkins busy being Bearded & Wise in other myths at other studios), and Sigourney Weaver slinks in and out so fast she may as well be an extra. 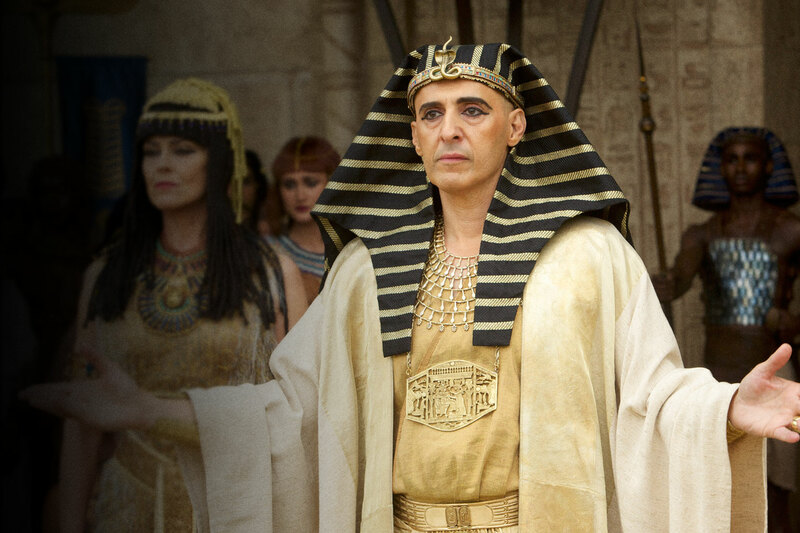 John Turturro got slammed a lot (way overmuch) by critics who had a tough time accepting him as the elder Rameses (why not? he does nothing untoward–I thought he was fine). Best reviews for the cast went to the constantly surprising Ben Mendelsohn, having fun being slurpily effete. Much ado from the p.c. police about the color-coding of the principle players—‘should’– being the new marching order so as not to possibly offend someone, somewhere, over something. Scott dismissed the casting critiques, rather clumsily, which just added more cranks to the (hand)wringer. Reviews were not good, as issue was taken with almost every choice the director and his quartet of writers made, none of which bothered this irreligious scribe as I watched it all unspool. God talking to Moses in the guise of a snotty little kid? I’m inflamed by the temerity. Music score by Alberto Iglesias is suitably grandiose, but it leaves scant impression, unlike the enthralling, envelope-your-senses themes conjured up from the likes of Miklos Rozsa or Alex North in the glory days of the 50s and 60s. Cinematography looks great, thanks to Dariusz Wolski (plenty of swooping vistas of masterfully done CGI architecture and crowd scenes); the costumes, sets, and paraphernalia all high-grade. 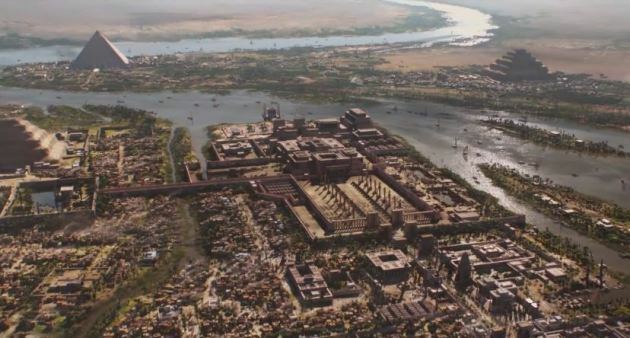 It made $268,000,000, which is a chunk, but not a patch on the inflation-adjusted rake in from that pontificatus piratus Cecil B.’s The Ten Commandments, which lords at one billion, sixty-three million in current dollars. Banned in Egypt, Morocco (where it was partially filmed), Kuwait and United Arab Emirates. 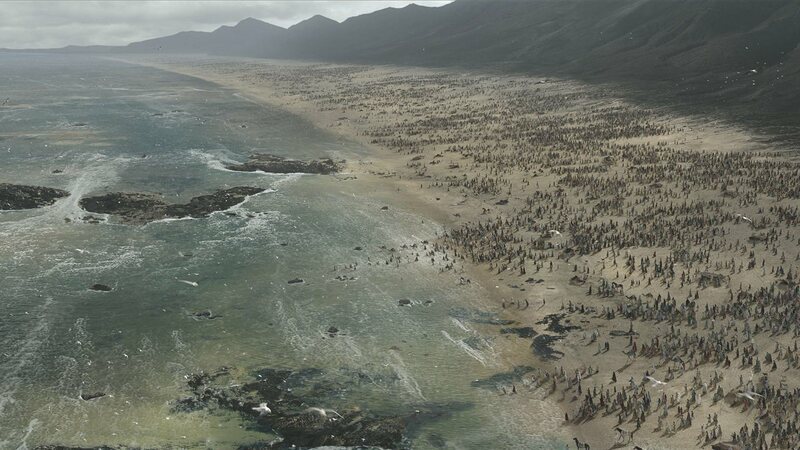 With Maria Valverde, Indira Varma, and thousands of extras (that digital magic making a mob of 400,000).